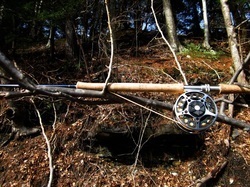 We carry a wide variety of Sage, G. Loomis, Winston, and Ross Spey, Switch and Two Hander Rods. We also stock a full linup of Skagit, Scandi and running lines so you can be sure you get the exact line for your rod and casting style. In addition to our many in stock lines we carry both the Skagit Flight Mega Kit and the Steelhead Scandi Mega Kit. Contained in these kits is every single Skagit Flight or Steelhead Scandi in Rio's arsenal. We are sur to be able to find the perfect line to maych not only your rods grain window but also your casting style. For more information on what lines best for your rod gice us a call (302) 654-6515 contact us here or check out these great rescources from rio. Our two handed casting lessons are done on the water and on a private basis. We need to be in the water in order for the line to load the rod properly. Due to the fact that we are in the water you will need to bring appropriate wading gear as well as a fishing license. During this 2 hour lesson we will work our way through the basics of the 2 hand casting style, incorporate 2 or maybe 3 Spey casts, and hopefully give you the foundation to begin your journey down the road of the Spey caster.